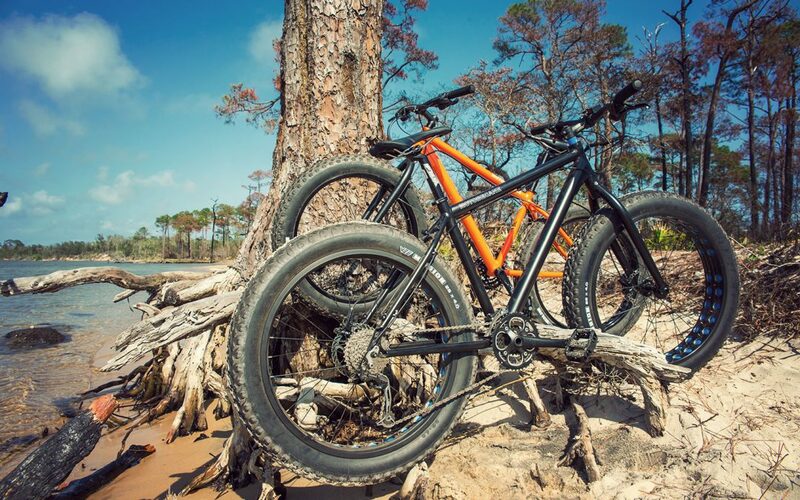 Pensacola Mountain Bike Tours have new fat bikes! I just received my Motobecane Pensacola fat bikes! A fatbike (also called fat bike or fat-tire bike) is an off-road bicycle with oversized tires designed for low ground pressure to allow riding on soft unstable terrain, such as snow, sand, bogs and mud. They are equipped with Shimano 27-speed drivetrains, 4 inch tires, and hydraulic brakes. I can accommodate riders from 5’4″ up to 6’4″ depending on how I set up the bikes. Everything needed for a great fatbike adventure! Book a tour and take one for a spin with me! If you are looking for a great experience and beautiful scenery, you won't be disappointed. We had a great trip and the guide was very helpful. The tour took us through different landscapes including a great view high over Pensacola Bay. The tour included all of the equipment necessary including high-end fat bikes. I was amazed how well the fat bike tires went over the terrain. Overall, it was a great tour and I can't wait to go again. Last minute trip to Pensacola and was looking to get a ride in. Randy was very accommodating with my last minute request. He met me at the trailhead and had all the necessary equipment. Bike was great. Trail was great. All in all a great experience. Would definitely recommend to anyone looking to rent a bike. This was by far the best tour I have been on! We were able to experience tons of breathtakingly beautiful views as well as seeing some wildlife along the way. He was very informative and gave us lots of history about the areas we biked through. He was also easily able to answer any questions we had and was very friendly with us. He provided us with the bikes and was very knowledgable about the different types of bikes and what they were used for. 10 out of 10 would recommend this tour to anyone visiting Pensacola, Florida!! And I will definitely be doing this tour again when I return in the future!! In November 2016 my partner and I took the bike tour in the Pensacola Beach area. Randy was outstanding in his knowledge of the area and Fort Pickens. The wild life was exquisite, we took loads of photos, and the tour was perfect for our skill level. I will definitely return from Baltimore to Pensacola and when I do, I know we will be contacting Hamilton MTB Tours. Can't wait to be back on the trails again. See raw Florida! Randy is a fabulous tour guide and he will take you to breathtaking sights. The National Seashore has so much to offer and with Randy, you will be able to see all of it! It was my first time mountain biking ever, and it was such an amazing experience. Seeking adventure? This is for you! Exhilarating!!! I had a blast and great workout. The Gulf Islands National Seashore Live Oaks Area trails are some of the most beautiful and unique trails I have seen. I saw long leaf pines, live oaks, palmetto fields, high sand dunes and the Pensacola Bay all on one ride. The Fat Tire bikes are a joy to ride! They can go over anything put in front of you. Highly recommend this tour! What a great tour in Gulf Island National Seashore! Great idea if on vacation and need a break for a bit from the beach. A fun ride, comfortable bike, & great guide. I would highly reccomend this! MUST DO! Going in as an inexperienced trail rider, I was pleasantly surprised with not only how much I enjoyed the ride through the beautiful National Seashore, but how prepared our guide Randy was with all the necessary gear, nice bikes, and knowledge of the area. As a local to Pensacola, I didn't even know these trails existed! It was an excellent workout but he adjusted to your pace. Really impressed with the entire experience and I'd recommend it to anyone. PS - His professional photography skills also came in handy! After taking this awesome and amazing tour, I highly recommend doing this event in Pensacola, Florida! Me and my boyfriend took this tour and we had an absolute blast exploring the outdoors and intaking an amazing environment! It is definitely worth the experience, so if you are looking for a fun outdoor event to do, TAKE THIS TOUR! Thanks again Randy for the awesome experience!